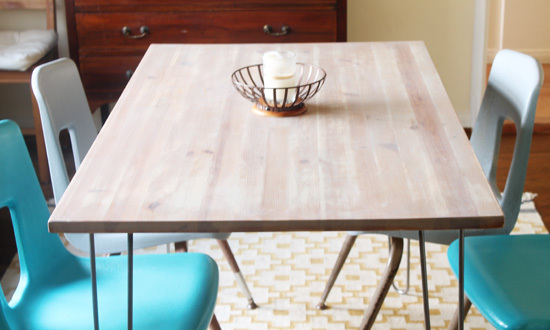 Last week I performed a little Ikea hack on my dining room Ikea Jokkmokk table. My initial idea was to remove the legs, replace them with hairpin legs, then sand and re-stain the top. I will admit, I often have grand diy ideas but my execution often doesn't pan out. I am happy to say that this time around, everything worked perfectly. My table turned out better than I could have imagined and I absolutely LOVE it. Plus the whole hack was SO simple....just a few easy steps. Remove legs and trim - just a few screws. I used this $30 Black & Decker sander and the stain I chose was RustOleum Sunbleached. I bought hairpin legs from this shop on eBay for $50 and screwed them to each of the four corners. I placed each one about an inch in from the edge. That is all I did. Besides drying time in between the two coats of stain, this whole project took less than an hour. 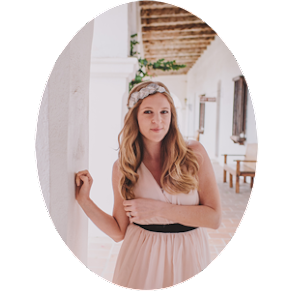 I love when projects are super simple and produce big results. I think it looks SO much better and my favorite part is that I now have an original table. 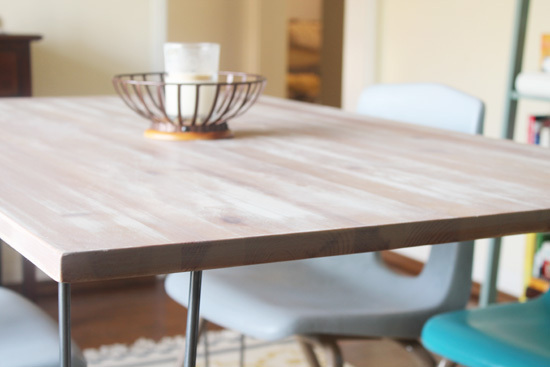 Table top (http://www.ikea.com/us/en/catalog/products/50106773/) for $80? yes, of course! you can use any table top...I just used the Jokkmokk table because I already had it and didn't want to buy anthing new :). thanks anna! I got them at a consignment store for $2 each. They are old high school cafeteria chairs that I spray painted. Hi! I love what you've done with the table, it's so awesome! I have a question about the stain - I also have an orangey wood piece that I'd like to stain and sand (similar to what you did) and I'm wondering if you found that the Ikea wood was actually much lighter in color or if the sunbleached stain actually changed the original orangey finish to that beautiful color? Hi morgan - When I sanded the wood, there was little color left so the stain easily took to the wood. If I had not sanded, I don't think the result would have been the same. Why did you spray paint the chairs but not their legs? Hi Deb - I like the metal on the legs. The original plastic on the chairs was a gross color so I was eager to change that! Fantastic tutorial - very helpful! 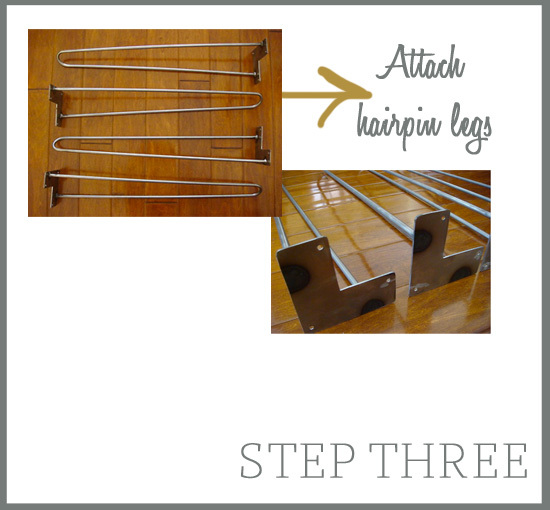 I got a question for you, what is the height and diameter of the hairpin legs you used? I am planning to do the same and I am just worried about the how strong these hairpin legs are. thanks! the height of the legs is 29". Not sure about the diameter....The legs are very strong. I assume the larger the diameter, the stronger they are. question? what did you do with the chairs? I want to do this with my table, but keeping the chairs?? hmm I was inspecting them and the might look cute covered in some retro slip covers. I kept the chairs in their original condition. 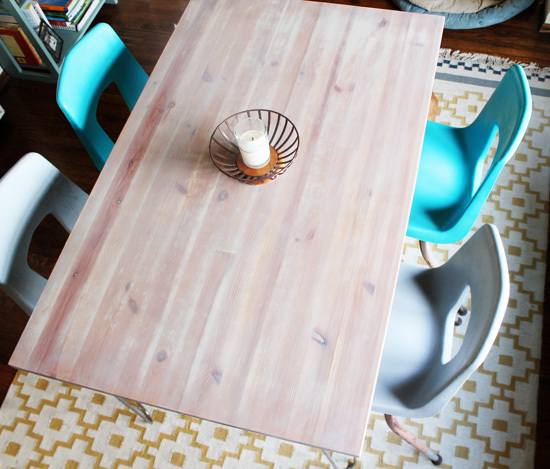 They are actually back at the table now and the cute gray and turquoise ones have been moved to other places. My husband didn't like the gray and turquoise ones....it is a little annoying that he is a man with an opinion :). I think slip cover would look good! I absolutely love this! I have this exact same table and I can't wait to try something like this. Love the table hack. Hairpin legs are the best. I have a question about your spray painted chairs. I know you don't have them there at the table any more (boo, hiss to husbands with decor opinions ... I have one of those too). But I was wondering how well the paint job holds up as they are used. Did you use basic spray paint? I've been thinking of spray painting my stools but I would guess they would get all scratched up from rivets on jeans, etc. Love this idea! 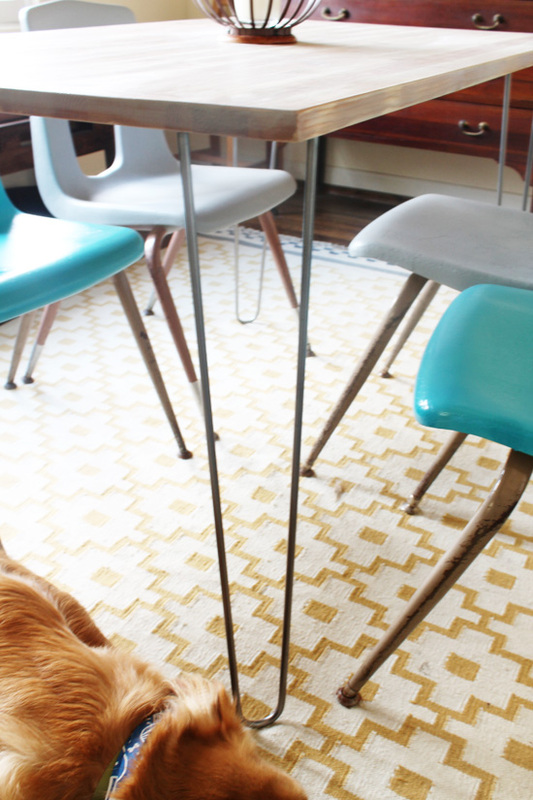 Do you happen to know another affordable source for the hairpin legs? The store you suggested on eBay no longer exists. Thanks! Hmm, no not sure. I would suggest just searching around on ebay or etsy. Thanks! Hi, is a support beam needed in the middle portion of the wood slab ( to prevent wobbling, if any?). Im planning to use the hairpin legs with some found wooden slabs :). thanks! hi there! No, I did not use a support beam. The table is a little bit wobbly - but it isn't too bad. I am sure a support beam wouldn't hurt :). Thanks for the reply Gina. Happy New Year to you. Just about to do this project, but am not sure what to do with the original chairs. Did you end up staining them as well? I actually just bought new chairs - and left the original ones as is. Have fun with your ikea hack! I was just looking for new kitchen table ideas and this crossed my reader! Love it. I'm about to go buy the table used from someone (lucky again)- any special tools you needed to get the legs off? Hi Kat- Nope, just a screw driver and maybe a hammer to knock the old legs out of place :). Thanks! I've got the table all disassembled. Two more questions- do you think it's really necessary to use an electric sander, or would a little more time work with sandpaper by hand? Did it take alot for the existing varnish to come off? And, I couldn't find "sunbleached" anywhere, so I'm going to experiment with "driftwood", any thoughts? It seems pretty gray. Hi Kat! No, it isn't necessary to use an electric sander. I own one and it's easier to use one on larger projects like this, but you could easily do this sanding by hand. 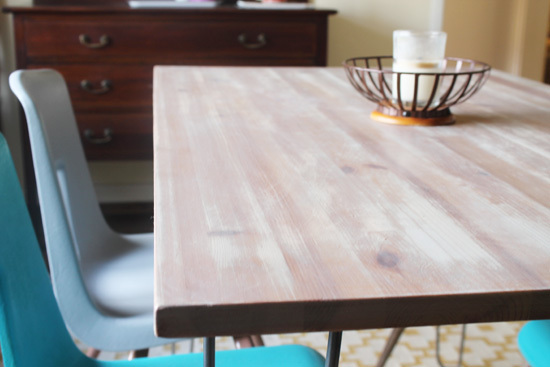 The existing varnish on the table isn't that thick and just a light sanding worked for me! As far as the stain goes, the one I used was pretty gray too. I put on a light layer, let it sit for a few seconds and then wiped it with a soft cloth. This gave the wood a very light coating of gray, which is what I wanted. 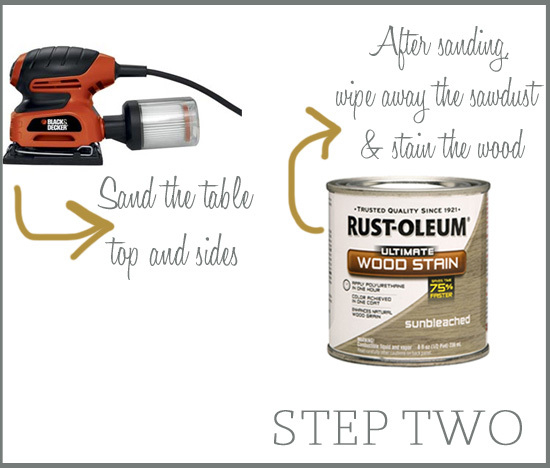 If you want a darker gray color, allow the stain to soak into the wood for about 5-10 minutes. and, you can always do a second coat. My motto is to go light at first and if I want it darker, I can always do more coats. Good luck! I'm in love with the teal chairs. Are they IKEA too? Hi Theora - No! I got them at a thrift store. They are old school cafeteria chairs and I spray painted them :). Yes, the sanding easily took off the stain. Certain Ikea furniture is covered in a laminate and that will require a primer before painting. But, other pieces are just wood covered in a stain. The ones that are stained are (in my experience) easy to remove. Good luck! I LOVE this project and I'm about to do the same, I have one question though.. How is the texture of the table now? is it smooth, or would you recommend to lacquer it in the end? wow, I have the same IKEA table and you have just inspired me enormously! 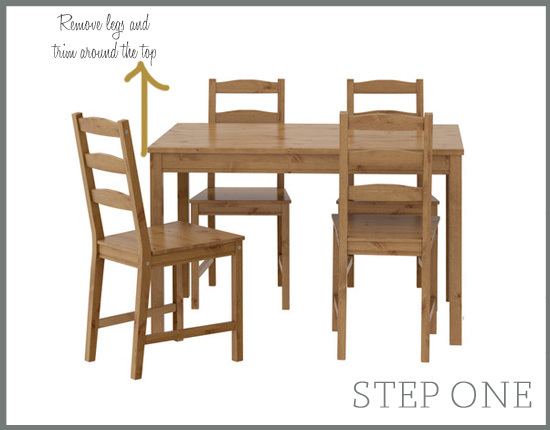 Do you still have the original wooden legs for the table? If you do could you sell me one or two? thanks!!! I am obsessed with your area rug!! I have been in the market for something similar without much luck. Do you know the brand/manufacturer? Seriously.. many thanks for starting this up. I love reading through a post that will make men and women think. Also, thanks for allowing me to comment! Love this idea! I have this exact same table so I'm excited to try it. What type/size screws did you use to attach the legs to the table? Hi! 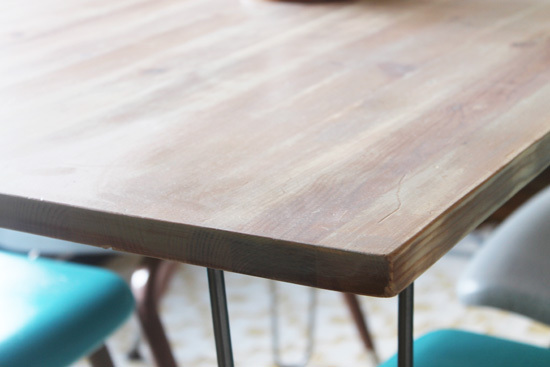 Did you have any issues with the table warping or bowing a few months after it was completed?